This entry was posted in fetal development, Uncategorized and tagged biology, by Dante, development, preborn, the unborn on November 25, 2011 by uOttawa Students For Life. 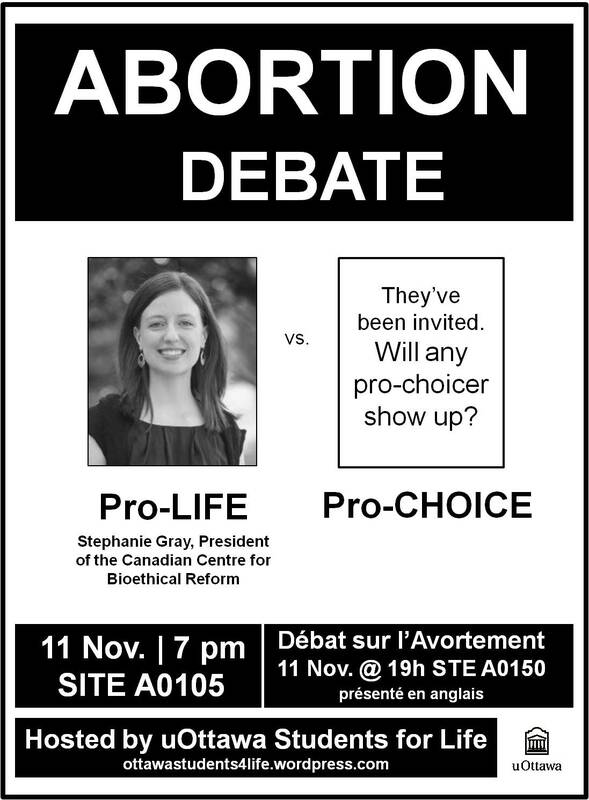 Ottawa has two opportunities to hear the formidable Stephanie Gray take on abortion this week. In addition to the event below, she’ll be speaking on Thursday, Nov. 10 at St. Paul’s University in room 103 at 7 pm. The topic is Abortion and Intellectual Honesty. Come one, come all! This entry was posted in abortion, activism, events, for your information, uOSFL and tagged abortion, Canadian Centre for Bioethical Reform, debate, events, intellectual honesty, Ottawa, pro-choice, pro-life, Stephanie Gray, uOSFL on November 7, 2011 by uOttawa Students For Life.